What is it about Australian native bush foods that makes them so darn exotic? OK, they’re Australian native bush foods. That’s exotic enough for most people, especially if you’re not in Australia … What many people might not know, though, is what an incredible diversity of fabulous indigenous foods we have on our doorstep here. Check them out. Do it. You will be amazed. You will want to try them. One of my favourite bush food staples is roasted wattleseed. It has a warm coffee-like aroma and flavour but then … there’s a hint of nuttiness … hazelnut? Maybe some subtle overtones of … chocolate? It’s delightfully complex. I use it in ice-creams, creams, desserts, cakes, pretty much anything. So why not macarons? Indeed. Wattleseed. Frangelico. A match made in heaven. Quite literally, if the Frangelico dudes have any street cred 😀 It’s exotic and yet so classic and familiar at the same time. Complex flavour, but a very simple combination. No weird stuff. Very Italo-Australian. Ha! 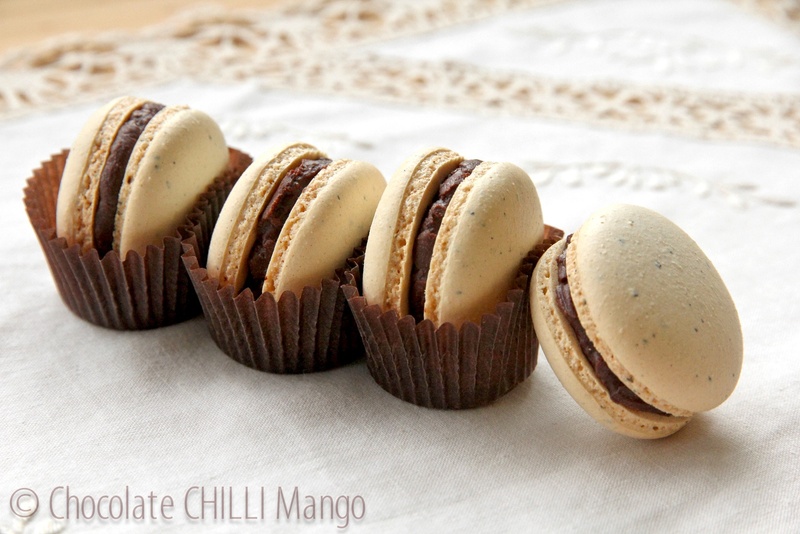 Rather than adding wattleseed to the filling, I added it to the macaron shells. I think they look rather cool with the wattleseed specks throughout and it lets you taste the flavours more cleanly. The filling is a simple ganache with Frangelico liqueur. Don’t use a chocolate that is too intense for this or it will overpower the Frangelico. A good quality chocolate with a cacao solids percentage in the sixties would be great. I like the Michel Cluizel Vila Gracinda or the Valrhona Gran Couva especially as they are both very smooth and seem to match the Frangelico and wattleseed flavours beautifully. But that’s just me. Blanching and grinding almonds into a fine meal is fantastic, but if you don’t have either the time or inclination, just buy ground almond meal. Depending on the degree to which the almond meal is ground, you may need to give it a whirl in a food processor before sifting. I do this every time, just to make sure that the almond meal is really fine as it gives a better result. I’m not going to go on about how to make macarons. There’s already so much written about them. Honestly, a lot of the beliefs about macaron making are more myth than reality. In this, I must agree with the very wise, very scientific Stella (aka Brave Tart). So, for the best, and most entertaining dissertation on macaron making and debunking some of those myths, I’d refer you to Stella’s excellent posts: Macaron Mythbusters and The Ten Commandments. You will laugh (a lot) and you will learn (even more). As a scientist, I can vouch for the integrity of her experimental method! But for now, I just want you to enjoy this particular macaron 🙂 Macarons are best served at least 24 hours after making them. After filling, store them in an airtight container in the refrigerator for at least 24 hours. This will develop both the flavour and the texture so that the shell will be crispy and the inside will be soft. Delicious … and that’s from someone who prefers making them to eating them. Scandalous. Of course, they are both wheat and gluten free. Preheat the oven to 150°C. Line 2 – 3 large baking sheets with silpat sheets or baking paper. Set aside. Place the almond meal and icing sugar into the bowl of a food processor and pulse until the mixture is very fine and silky in texture. You can test it between two fingers. I do this before sifting the mixture, but if you prefer, just sift the almond meal and icing sugar together. Once done, place in a large mixing bowl. Add the wattleseed and 55 grams of egg white and mix well with a spatula until you obtain a smooth paste. Set aside. Place the remaining 55 grams of egg white and salt into the bowl of a heavy-duty mixer and start whisking at low-medium speed. Place the water into a saucepan and add the sugar. Dissolve the sugar, in the water, over a low heat. Bring to the boil and cook until the sugar reaches 115°C. By this stage the egg whites should have reached a soft peak stage. Continue whisking at medium speed as you pour the syrup into the egg whites in a thin, steady stream. Keep whisking until the bowl cools to just warm. I usually whisk the meringue for about 10 minutes or so and turn up the speed for a minute or two at the end. The meringue needs to be stiff. When you lift the whisk, there should be a solid stiff clump on the whisk. It should be able to look you in the eye without flinching. Scrape a small amount of the meringue into the bowl with the almond mixture and work it into the mixture to lighten it, using a spatula or pastry scraper. I prefer the scraper. Scrape the remaining meringue into the bowl and fold it into the almond mixture, flipping it over on to itself, and turning the bowl with each fold. Make sure to scrape down the bowl to ensure the mixture is homogenous, and there are no streaks of meringue or almonds. Continue folding until the macaronage is at the stage where a little mixture, lifted, will fall back into itself slowly (i.e. the magma/lava stage everyone goes on about). Fit a large piping bag with a plain tip and pipe small mounds onto the baking sheets. Rap the baking sheets hard onto the bench to expel any air bubbles. Rap it again, harder, if you’re not sure. You can pop them straight into the oven or leave until the mixture forms a light crust for about 30 – 60 minutes. It’s up to you. Won’t matter either way. Bake for about 15 – 16 minutes. Depending on your oven, they may need another minute or so. 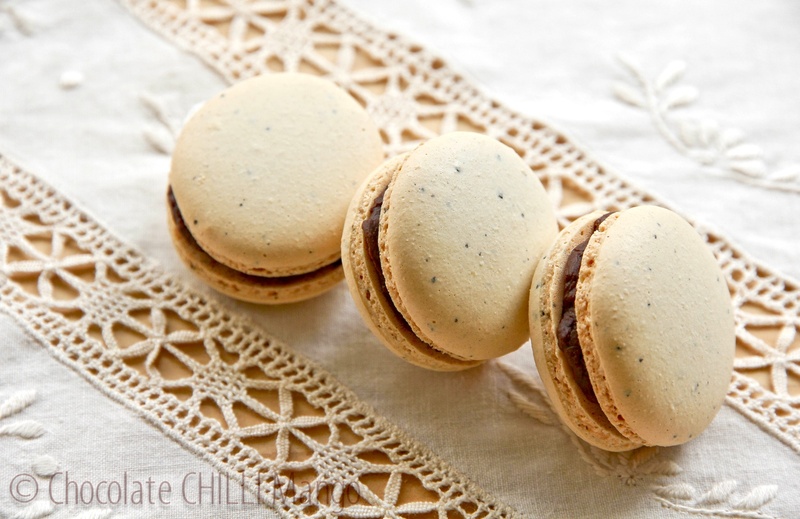 Remove the macaron shells from the oven and set aside to cool. Remove from the baking sheets and pair up shells of the same size. Chop the chocolate into small, even pieces and place in a heat proof bowl. Bring the cream to a boil in a heavy-based saucepan and immediately pour over the chocolate. Leave for about 20-30 seconds then stir until the chocolate is melted and the ganache is smooth. Gently whisk in the Frangelico liqueur. To cool the ganache to a piping consistency quickly, pour the ganache onto a silpat sheet on a baking tray, and spread evenly with a spatula or knife. Cover lightly with cling film, letting the cling film touch the surface of the ganache. Refrigerate until it thickens and can be piped. This might take anywhere between 10 – 20 minutes, depending on your fridge. Fit a large piping bag with a plain tip and fill with the ganache. Pipe the ganache on to one half of the shells and top with the other half of each pair. Gently twist the the shells together so that the filling distributes evenly. 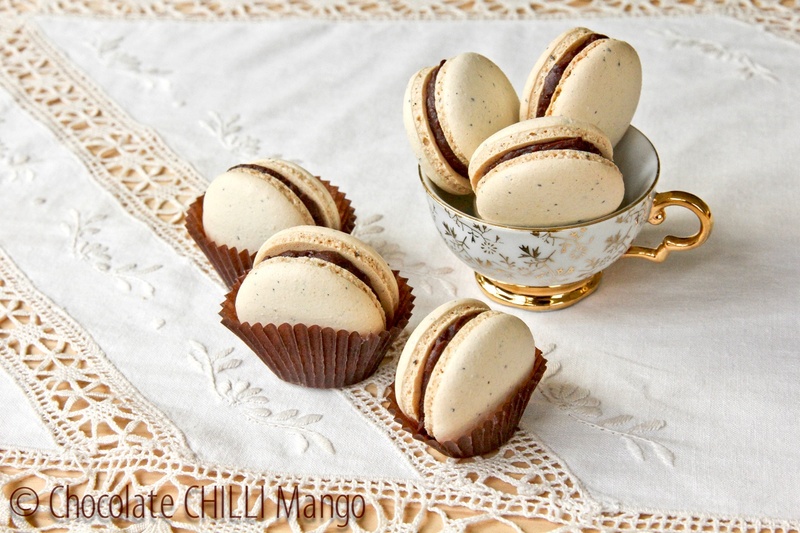 Store filled macarons in the refrigerator for at least 24 hours before serving. Remove from the refrigerator at least 30 minutes before serving, to allow them to come to room temperature. Enjoy!